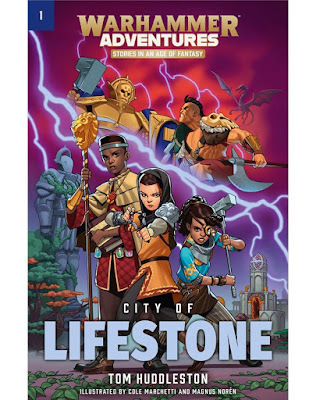 Advanced Dungeons and Parenting: With the Warhammer Adventures Series Games Workshop is on a Quest for Younger Readers. Do the Books Hit the Mark? 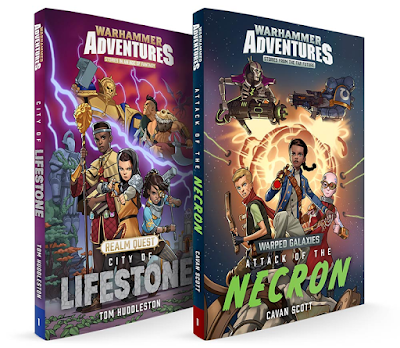 Games Workshop recently launched two new Warhammer related book series under the Warhammer Adventures label, one series for the Age of Sigmar fantasy setting and one for the Warhammer 40k science fiction setting. Games Workshop has a long history of publishing media tie-in fiction for their game lines. One can find Warhammer related novels and short stories dating back to the late 1980s with titles like Ignorant Armies and Konrad. As of this blog post there are well over 100 Warhammer related novels with a number of stand out series like Gotrek & Felix and Dan Abnett's Ghaunt's Ghosts. Games Workshop, like TSR/Wizards of the Coast, have shown themselves to be excellent providers of genre fiction. So the publication of a new line of books shouldn't be news, right? Normally it wouldn't be news outside of how it affected the metafiction, but this is Games Workshop's first foray into Young Reader Chapter Book fiction. 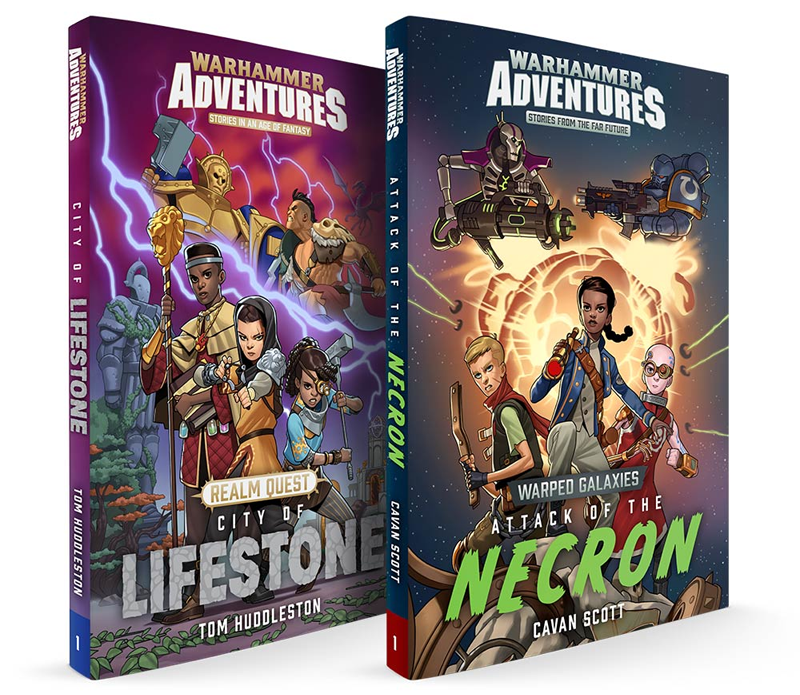 Past Games Workshop fiction has been aimed at the 12 and older crowd, but these new series are aimed at readers aged 8-12. TSR/Wizards of the Coast published a number of books for this cohort, starting (and continuing to this day) with their Endless Quest series of books where reader choices. Games Workshop has not reached out to this audience in the past, though it's founders did with the Fighting Fantasy Gamebook series, and there is a reason for that. Game Workshop's settings are in the genre frequently referred to as "GrimDark" fantasy and science fiction. This genre features settings that are filled with despair and violence and one might include writings like Michael Moorcock's Elric Saga or Karl Edward Wagner's Kane books as non-Games Workshop exemplars. Though the GrimDark genre predates Games Workshop, there can be little doubt that the neologism GrimDark has it's origins in the tagline of the Warhammer 40k Universe, "In the Grim Darkness of the Future, there is Only War." That line sets the tone for all of Games Workshop's game universes, so what room does that leave for fiction aimed at Chapter Book readers? The simple answer to this question is, "plenty." As grim and dark as the Games Workshop settings are, they also have a history of adjacent silliness. Games like Blood Bowl and GorkaMorka take place in horrifically terrifying worlds, but they are extremely lighthearted. Games like these show a more kid friendly face, but this kind of appeal isn't limited to spinoffs. Games Workshop Grognards who followed the development of the Brettonian army in Warhammer Fantasy can testify to how the game became more kid friendly in the 90s. While the Brettonia of the Warhammer Fantasy Roleplay Game of the 1980s was a place of corruption, debauchery, and vice that made Game of Thrones look civilized, by the time the Brettonians received their own book for the Warhammer Fantasy Battle Game they had been transformed into the noble knights of Howard Pyle and Roger Lancelyn Green rather than extras from Flesh + Blood. The company has always pursued younger players and has altered the tone of their setting to accommodate both young and old. I call their most successful attempts to bridge this gap "DimDark." It's grim enough that adults can enjoy it and see that it reflects the overall setting, while also being innocent enough that 9 year olds don't get nightmares. So how do they fare this time? Do these new books manage to capture the feel of the setting, while still being "appropriate" for younger readers? The answer to this question is, "Yes, for the 40k inspired series and we'll have to see how the series develops for the Age of Sigmar inspired series." In a way, the answer reflects the depth of the settings themselves. The Warhammer 40k setting is long-standing and rich with detail, where the Age of Sigmar setting is newer and still not completely flushed out. To demonstrate this, let's examine the books in some detail. We'll start with Warhammer Adventures: The City of Lifestone by Tom Huddleston. 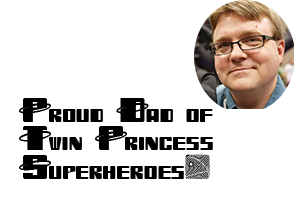 Not to be confused with the actor who plays Loki, Huddleston is an established author of young reader fiction who has written original fiction and media tie-in fiction for the Star Wars setting. The City of Lifestone begins its tale on a world of fire and fury called the Plane of Aqshy. For those not versed in SF/F lore, a plane is a universe in its own right. Aqshy is one of the many "Mortal Realms" of the Age of Sigmar setting and it is also known as the Plane of Fire. The book's protagonist, Kiri, is currently enslaved by Chaos worshiping Darkoath Barbarians. These barbarians are similar to the Bloodreavers featured in the Shadespire Boardgame. Kiri's mother is dying and tells her that she must flee this realm and find the city of Lifestone, located on Ghyran the Plane of Life, using the Realmgate recently unearthed by the Darkoath Barbarians. Lifestone is a place of scholarship and healing from which Kiri's mother fled due to a mysterious, and as yet unexplained, cataclysm. Though under normal circumstances, such an escape would be impossible, a company of Stormcast Eternals arrive and attack the Darkoath Barbarians providing a perfect distraction. The Stormcast Eternals, Champions of Sigmar and Opponents to Chaos, want to keep the gate out of the hands of the Darkoath Barbarians. This conflict provides Kiri with a chance to escape, even as she leaves her dead mother behind. As an aside, this also provides a perfect segue into the Shadespire Boardgame, since that game's introductory units are the very Darkoath-esque Bloodreavers and the Stormcast Eternals. Though the game takes place at a location far from Kiri's slave camp, it really does make a nice tie-in to bring in new gamers and the Shadespire game is young gamer friendly in the highest. After fleeing Aqshy, Kiri eventually finds the City of Lifestone, only to find that the city is not the vibrant and happy paradise she imagined. It is a solemn and dying city, who's once great fountain of healing has long since dried up. Kiri is on the edge of despair when she gets caught up in the machinations of two individuals a mysterious hooded woman and a sinister Shadowcaster. The hooded woman warns Kiri that the Shadowcaster kidnaps children, including her own child, but when Kiri meets those children (Kaspar, Thanis, Alish, and Elio) they don't behave like kidnap victims and instead tell her that they are fated to be together. Was the hooded woman a liar, or is the Shadowcaster using magic to enslave the children as a kind of wizardly Fagin? The book is engaging on many levels and has at its core a good adventure spark. There are suggestions that the children are indeed linked by marks they bear, one for each of the Mortal Realms, and that their link might be connected with the cataclysm that overcame Lifestone a generation ago. The character mix has all the elements of a fantasy party. There is our protagonist Kiri, who is untrusting of others and wants to go it alone. She is joined by the warrior girl/woman Thanis, who sadly only has armored gloves and no sword. The mechanically minded Alish, who has a giant hammer that she uses to good effect. The sneaky Kaspar, who may or may not be the child of the mysterious hooded woman. Finally there is Elio, the proto-witch hunter though a more scholarly witchhunter than one typically imagines in the Warhammer Universes. It's a good mix of characters for an epic adventure, but due to the young age of the protagonists Huddleston's adventurer's actions are decidedly non-lethal. Kiri, for example, wields a slingshot (called a catapult in the book) which is effective at hurting, but not at killing, foes. Given that the setting is dim-dark, this lack of lethality hurts the plausibility of the storyline and undermines an otherwise epic tale. For some storylines, the lack of lethality by young protagonists would be fine, but this particular story has a scene where the adventurers fight a pack of Skaven. Given that the Skaven are portrayed as a lethal threat, the characters non-lethal weaponry seems unrealistic. It's a small flaw given that the book is written for 11 and under, but it is a flaw none the less. The book needs a little more "Grim" on the part of the protagonists to successfully pull off the new "Dim-Dark" genre. Overall, the book is a quick and engaging read, but it suffers from the fact that the Age of Sigmar setting is still lacking in mythopoetic worldbuilding. Since the "Mortal Realms" diverges from many standard fantasy tropes, even as it uses them as a foundation, it requires more exposition of the mythic setting than is possible in a book this length. One cannot, for example, use their rough knowledge of the Holy Roman Empire to serve as a proxy for The Empire when reading these books. The "Celestial Realm" where the Stormcast Eternals live shares more with Asgard than with any other proxy, and even then the connection is not strong enough for the reference to serve as a proxy. I expect that as the series continues, and as the setting itself continues to be developed with lore etc., that this drawback will fade into the background.